** For guests booking Aug 10 - Oct 19, please see the end of this text for important information! 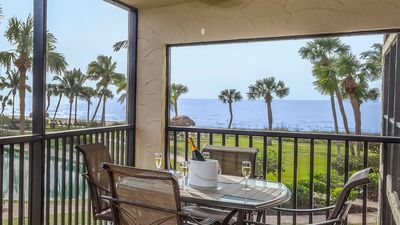 You’ll have a beautiful ocean and beach view and an inviting home away from home here in A21, whether you’re in the kitchen, getting fresh air on the lanai, curled up on an overstuffed sofa, or just taking in the view from the King-sized bed through your floor-to-ceiling glass doors that look out on the Gulf. 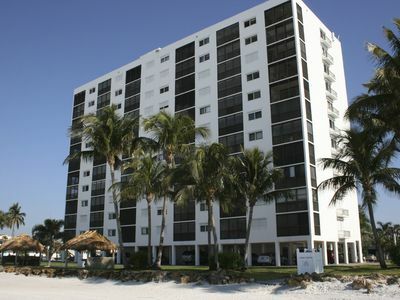 Our building is as close to the water as you can get on the whole island. 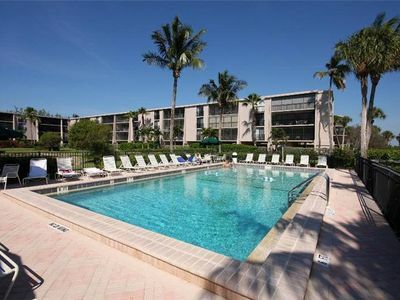 We're just steps from the beach and pool, it's an ideal location. You’ll be provided virtually everything you need for play on the beach or in and around the pool and club. We offer a beautiful 55” flat-screen TV in the living room, along with a DVD player that will access your Netflix or Amazon accounts! The master and guest bedrooms also offer 32” flat-screen TVs. If you also like to have a little music, we offer a Sony radio/CD/iPod player and a separate tape player in the living room. 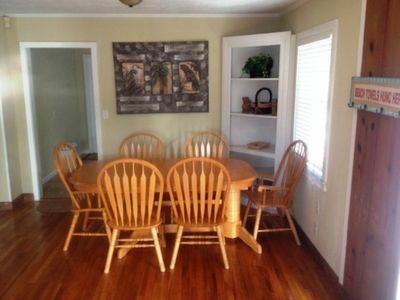 You’ll have room for four to six people in your private condo. In addition to the king bed in the master bedroom, the extra bedroom has two twin beds, and the living room offers a queen-sized sleeper sofa. The master bedroom has a private full bathroom with an extra-large rainforest shower plus handheld showerhead, and a newly tiled floor. A new granite counter tops the two-sink vanity. 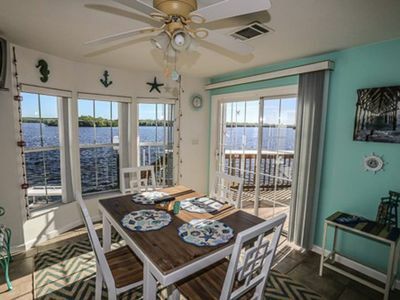 The bathroom offers a new well-lighted cosmetics table for the evenings you choose to spend out at fine dining, clubs, or other night-life spots on Sanibel. The guest room offers an attached bath with a combination shower and tub, also recently updated. 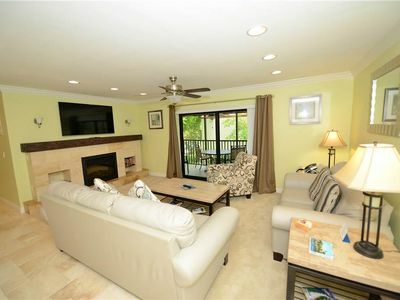 The kitchen is well equipped with lots of cooking and serving utensils, and granite-top island. This is an open plan kitchen, so you can prepare a snack or a multi-course meal for six but still chat with friends in the dining area or living room. We provide the extras that some units overlook -- laundry baskets & a hamper, great bathroom lighting, labels on the light switches so you're not left in the dark, extra keys, extra coffee filters, and many other touches just intended to make things feel familiar and comfortable. Even dishwasher & laundry soap! 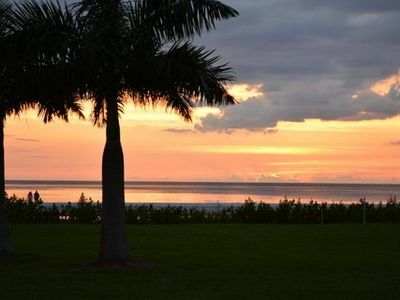 Pointe Santo's tropically landscaped grounds include a swimming pool, a hot tub, six outdoor gas grills and on-site supervised children’s activities for kids 4 and up on weekdays year 'round, during high season Sundays too. 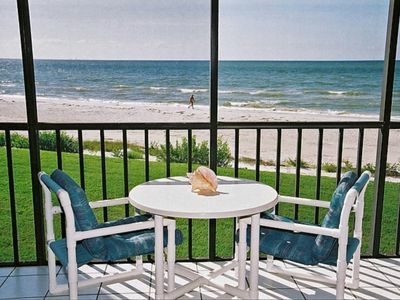 With one of the best beaches on Sanibel, it is the ideal location to enjoy the Gulf. You’ll be close to restaurants & shops ranging from casual to upscale, and a choice of golf courses. 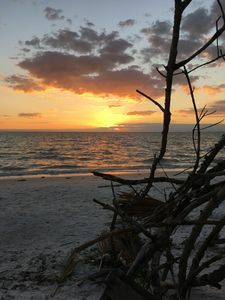 Yet with all the peace, quiet, and beauty, you're just a short drive away from the diverse shopping, entertainment, & dining opportunities in Fort Myers, Florida. We book the unit on a weekly basis, from Saturday-to-Saturday, with a few exceptions for less busy times of year. Although you may arrive late or depart early, we charge for the entire booking. We took ownership of the unit in December 2012, and we've done important updates & upgrades every year! *** A quick word of thanks to our many repeat guests! It is such a pleasure to talk to so many of you, and to know that you love our place enough not only to come back year after year, but in many cases to contribute small decorations, or even small appliances (! ), really helpful ideas and suggestions for making things better, and just saying "Thanks!" for all we do to keep the place beautiful and inviting. It's a bit of work, but it's also very rewarding to hear from you. Thank you all so much! * Orange juicer - a guest bought one and suggested we try it out. Imagine - fresh Florida orange juice from fresh Florida oranges! Thanks Marty & Nancy! * A few complimentary "pods" for the both the dishwasher and clothes washer, in labeled containers -- sometimes they're hard to tell apart! * We do three "deep clean" sessions per year, including steam cleaning the carpet. Our last deep clean was in April, with others to be scheduled for August & December. * New Cuisinart MultiClad 8, 10, and 12 inch skillets - MultiClad are the best! * New quiet, quick, and generously sized clothes washer & dryer - Best-ranked by NYTimes, LG Brand -- front-loading and energy-efficient! * All new 500 TC Egyptian cotton sheets & all new pillows, and lots of them! * From our big-screen TV in living room, log in to Netflix, Amazon, Hulu and more! 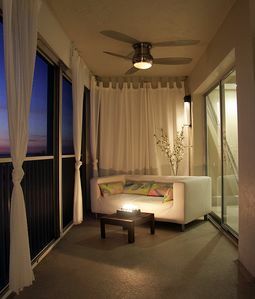 * Ceiling fan on the lanai! Of course, we bring in all-new bed sheets and towels every year for both the master and guest bedrooms, along with other wear & tear fixes & replacements that are too numerous to mention. 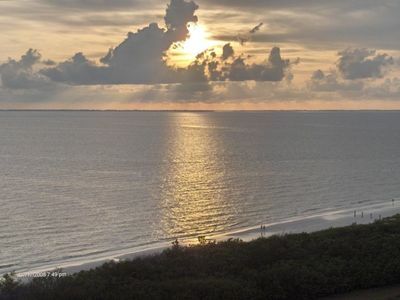 We're Glen & Betina and because of the beauty, the peace, and simply amazing views we fell in love with Sanibel starting in 2010. You probably will too! You can contact us with questions (in English and German) or click 'Book it Now'! 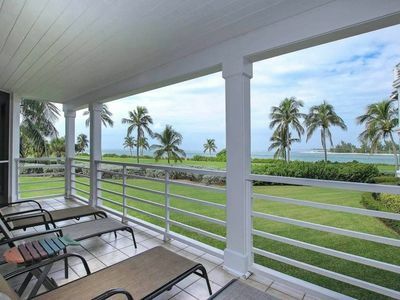 Our view of the ocean & beach is simply outstanding; few units on the island can match it. 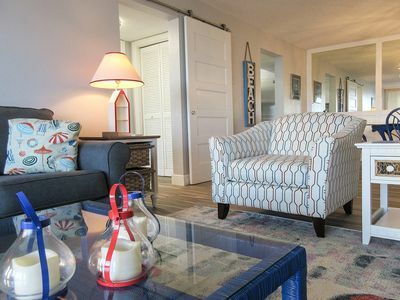 The unit is beautifully furnished in a 'modern beach' style. Our guests seem to love it, too! We stay in the unit ourselves at least two weeks of year, and we try to keep it like a second home. We redecorate & update whenever we visit. We renovated both bathrooms in November 2013. Our location? We're 2 minutes by car from the nicest part of the business district, with very good local restaurants and shops but plenty of peace and relaxation. You'll also be able to contact us, the owners, directly - not just an answering service or rental agency. We're happy to help with any questions before, during or even after your visit. 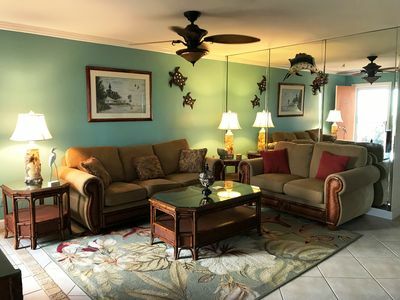 We want to keep our place looking & feeling like a happy home, for us & our many repeat guests! * Construction work is planned for summer of 2019 in the C building at Pointe Santo. For 2018, the planned dates are Aug 11 until Oct 19. We expect significant noise intermittently, but it isn't possible to say exactly what dates or times. * We have lowered our rates during this time. 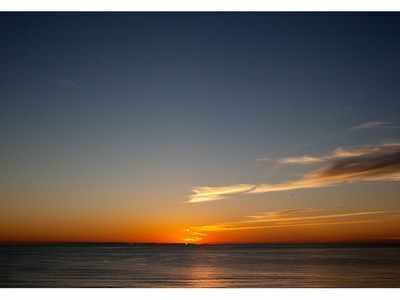 * Our amazing view and beach access will not be changed during the work! * The pool and outdoor hot tub at Pointe Santo are scheduled for cleaning two days each year, generally the Tuesday and Wednesday of the last week in September. During that time, the area can't be used by visitors. Because of this, we offer a special rate for that week, already deducted from our price for 2018. This year, the dates are Sept 25th & 26th. Affordable! 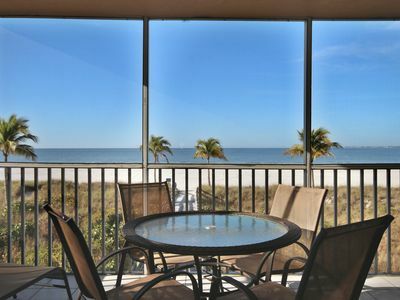 Private Wifi, Beach, Pool, Tennis, Walk Everywhere! 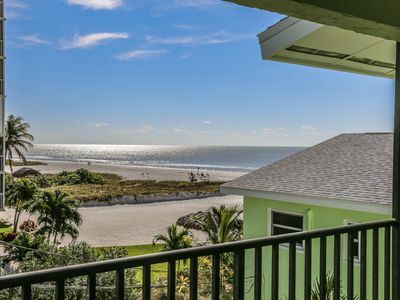 Beachfront Condo – Enjoy Fort Myers Beach At Its Best! Perfect Location! 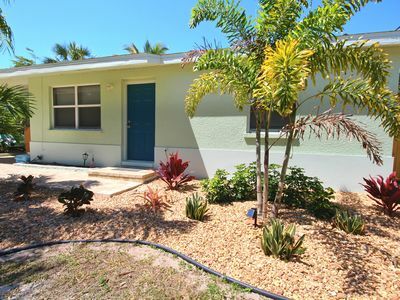 Walking distance to beach, shops, & restaurants! LIGHT, BRIGHT, & BEAUTIFUL! 8th FLOOR, INCREDIBLE DIRECT SUNSET VIEWS! 165 in outdoor THEATER pool side. 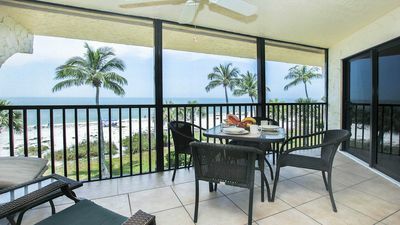 Across the street from beach and Diamondhead. Don't judge a book by its cover or this home at 51 Emily Lane by the outside of it. 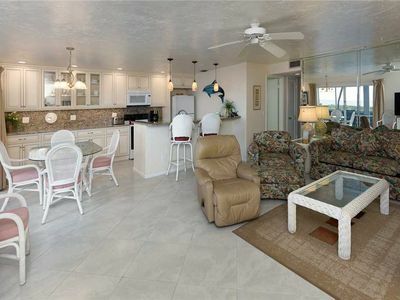 BEACH FRONT, HEATED POOL, TENNIS, SHUFFLEBOARD and more..